because I really wanted to know what happens in large commercial farm fields in California, which supplies most of the country’s fruit and vegetables. Based on what I’ve read in the past, it didn’t sound good. The book chronicles the experience of author Tracie McMillan, who spends a year in various jobs in the food industry. She starts in three different jobs in farm fields, first picking grapes, then peaches, and finally “cutting garlic,” which means harvesting it and cutting off the roots and stems. The whole experience was sad to hear, but it confirmed what I’d heard from Illinois fruit producers who have a very hard time finding people to work for them. Because McMillan is white, people usually did not even believe her when she first showed up and said she wanted a job. She had to concoct a story of being down on her luck and wanting a job where she didn’t have to deal with customers or think. Even then, people were always suspicious of her. When she left one job, she told some of the people her true identity, and they said they knew that she had been lying about her background, but they had been thinking (perhaps hoping) that she was a spy from the government investigating working conditions. Because McMillan “has papers,” meaning she is a legal citizen, other workers kept telling her that she would get minimum wage, but she was normally paid about $2 per hour, which was the same or less than the illegal immigrants with whom she worked side by side. Laborers are generally paid by the piece, so more experienced, stronger, and faster workers get paid more. However, as McMillan quickly discovers, no one could work fast enough to earn the equivalent of the minimum hourly wage. When she goes to work for one company that has already paid big fines for labor issues, she sees that her paycheck misrepresents the number of hours she worked. The company paid her based upon how much she picked, but they divided the total they owed her by the number of hours it would have taken to earn it at minimum wage. So, on her paycheck it said she was working about two hours per day, when in reality, she was working eight or ten hours per day. 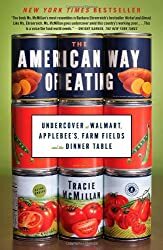 McMillan chose to work at Wal-Mart because it’s the largest grocery store chain in the country, and she chose Applebee’s because it’s the largest casual restaurant chain in the U.S., which means they sell food to a huge percentage of Americans. Her experiences at those places were not nearly as interesting to me, although other readers might think differently. I was saddened to hear that she never received proper food handling training at Applebee’s but was coached by other workers to claim that she had, when questioned by the corporate person who came in to evaluate the restaurant. The few training meetings she attended, she didn’t get paid for, even though she was told she would be paid. Although she did receive great video training on food safety when working in produce at Wal-Mart, the store where she worked did not always follow company policy. For example, when a bird got into the store, managers refused to call a professional to catch the bird because it would cost $10,000, which they said corporate wouldn’t like. I wish that more people knew where their food came from. When people like Michael Pollan say that you vote with your fork three times a day, they aren’t kidding. As long as people want cheap food and keep buying food based upon price, the food industry will continue trying to deliver the cheapest food possible, which means they’ll continue to employ illegal aliens and neglect to do anything that will increase expenses, such as provide paid training for employees or get birds out of stores. If you eat, you should read this book (or listen to it). As I so often do, I purchased this book on audio so that I could listen to it on my iPhone while milking goats or driving my car.